How Do You Install New Wall Soundproofing? New walls are a good place to start with soundproofing because they are like a blank canvas. 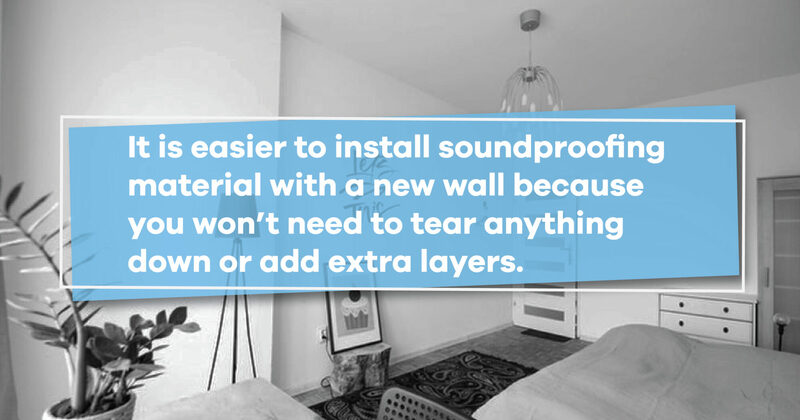 It is easier to install soundproofing material with a new wall because you won’t need to tear anything down or add extra layers. 1. Install Quiet Barrier HD on the studs with 1 ¼-inch roofing nails. 2. Seal the seams of the Quiet Barrier with Quiet Barrier Tape. 3. Install ⅝-inch Type X gypsum board with 15/8-inch coarse thread drywall screws. 4. Place screws with eight to 12 inches of space between them. 5. Leave a ¼-inch gap between the gypsum board layers and adjoining surfaces. 1. Install the IsoTrax Soundproofing System on the studs. 2. Install ⅝-inch Type X gypsum board on the IsoTrax with 1 ¼-inch fine thread drywall screws. 3. Place screws 12 inches apart. 4. Leave a ¼-inch gap between layers. 5. Fill the gap with OSI Pro-Series SC-175 Acoustical Sound Sealant. 6. Finish the gypsum board. With IsoTrax in your new walls, you’ll get to enjoy soundproofing peace for years to come. If you’re on a budget, you might opt to soundproof new walls using fewer materials. For example, you could leave out Quiet Barrier, but still use Quiet Batt and IsoTrax. This would help reduce noise shared between rooms or noise in the room. For decent soundproofing, you could leave out IsoTrax and use Quiet Barrier and Quiet Batt. This method will help reduce minimal noise between rooms, such as people talking or low-volume music. Place bookshelves filled with books against shared walls for sound insulation. Fill empty spaces with soft furnishings to prevent echo. Hang heavy drapes at the windows.